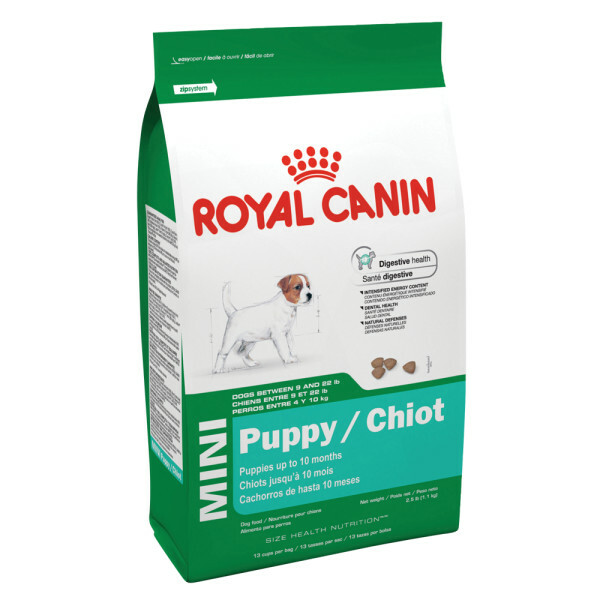 Your puppy needs a specially formulated food to help promote healthy development, and this food offers the vitamins, minerals and wholesome energy sources he or she requires to grow strong and healthy. This Royal Canin MINI Puppy Food offers complete nutrition to help your puppy stay active and healthy. The specially designed kibbles are shaped for your puppy’s small jaw to help encourage adequate chewing, while sodium tripolyphosphate helps prevent tartar and plaque build-up for improved oral hygiene. Optimal fibre content, prebiotics and low indigestible proteins help support a healthy digestive system, while a high energy content gives your puppy the boost he or she needs during growth. Because your puppy’s immune system is still developing, this food offers a specialized complex of antioxidants, such as vitamins E and C, lutein and taurine, to boost your puppy’s defences and help keep him or her healthy.